Dollar for dollar 2019 Honda Pilot brings much to the table in standard features and active safety. What’s new for 2019, and why is the refreshed rugged looking Honda Pilot outselling all the competition? We could cut the article short by looking to the obvious. A darn good looking well equipped Pilot LX FWD ( front wheel drive) can be had out the door for a bit more than $35,500 in most markets. While that’s a measurable bargain, there’s much more to Pilot's market success. Back in 2015 we predicted the reinvented Honda Pilot would drive the maker to higher sales ground. Why was Pilot the fastest growing midsize SUV in the segment for 2018, with record sales posted for January 2019? Much of that has to do with a bold mid cycle refresh. While there’s no mistaking Pilot for anything but a Honda, a bolder, more aggressive, damn near off-road ready look comes to market for 2019 -- creating a buzz -- as well as setting the industry benchmark for standard creature comfort and active safety and driver assists features. Honda Pilot long the favorite of the midsize 3 row family and soccer-mom crowd was the fastest growing SUV offering in North America for 2018. And looking to CR-V sales, Honda’s bread and butter light truck lineup kept America’s #5 automaker profitable, despite an auto industry-wide downtrend in sedan sales. 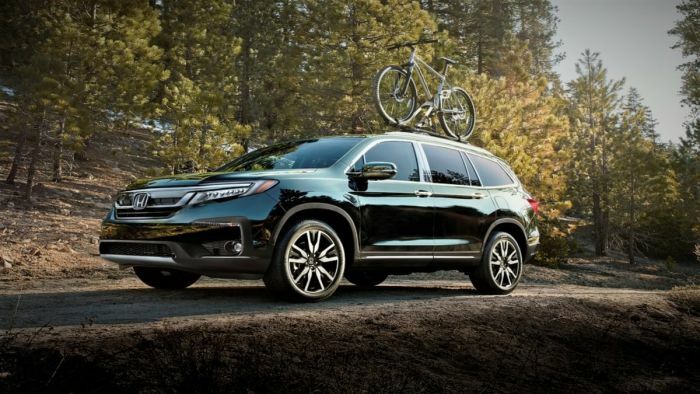 Check out the reinvented 2019 Honda Passport. Honda was not an exception to the downturn of 2018 experiencing a steep decline in overall domestic car sales of 12.1% -- although Civic remains the #1 retail sold sedan in North America. With a saturation of late model cars and SUVs on the U.S. market, innovation and quality control will keep American Honda profitable in 2019. Our 4th year Honda Pilot drive review experience arrived at the door in November 2018. This time a metallic silver on black leather 3-row Touring Edition AWD -- handsome in body line from every angle, with just enough chrome detailing to catch the eye, and standard accident avoidance and active safety features. Back in the winter of 2016 I drove Pilot across Western Oregon in an historic frozen rain storm. We discovering the advantage of seamless AWD engagement and variable surface condition traction control. Despite the ongoing argument between myself and my fellow domestic truck owners, I believe Honda’s seamless torque vectoring i-VM4 AWD to be the best in the segment as tested under variable road surface and weather conditions. Consumers discover a refreshed 2019 Honda Pilot with few mechanical yet several cosmetic and convenience upgrades, with a feature or two common to the reinvented 2019 Odyssey Minivan. Changes Include an over-sized high resolution tablet-like center dash mounted touch screen monitor. Features include Cabin Watch™, Honda’s 3rd row kid monitor and voice activated intercom, as well as a surround-view top mounted exterior color cam, available in Elite and Touring Trim. Available in 7 or 8 row passenger configurations, Pilot seating and interior trim packaging takes the “van” out of the minivan. This thing is posh! For 2019 we find outside camera image resolution to be very good day or night -- a measurable improvement for Pilot, and like the inclusion of a knob for quick access radio station selection. 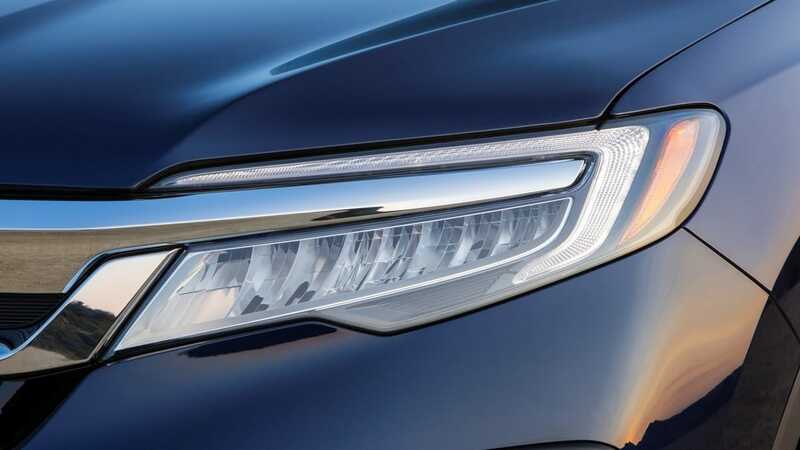 Also for 2019 Honda’s award winning Honda Sensing™ active electronic accident avoidance and driver assist technology is now standard equipment at all trim levels. Featuring adaptive cruise control, lane keep assist, collision avoidance brake mitigation, side and rear approaching traffic and pedestrian warning, Pilot underlines Honda’s goal to eliminate vehicle collision fatalities, while minimizing driver and passenger injury. While there’s no getting around the fact that Honda Pilot is a unibody primary front wheel drive SUV, with several truck-like capability and features. Yet through advanced chassis safety cage design and engineering Honda presents an SUV platform with uptick sedan like interior quiet, good handling suspension, braking, comfort and convenience features. Yes, there is some mild body roll noted in high speed maneuvers and sweeps, but it’s minimal, with down hill braking nose dive all but eliminated and torque steering at aggressive take off gone! But more than that, what I do note while driving 2019 Pilot is a sense of greater quiet, refinement, and up-trim ambiance. Frankly, the refreshed Pilot thanks to integrated Honda Odyssey features, Gives Acura MDX a run for the dollar, although granted, not as posh or precise. What we’d change: Not much. Although Pilot under certain road conditions could be quieter. Also, in speaking with consumers, with 13 trim levels to choose from, a turbo engine option would be appreciated.